Step up to the XFX FX-785A-ZNL4 VGA card for a new level of DirectX 11 gaming experience in the latest FPS, RTS, MMORPG and RACING titles. 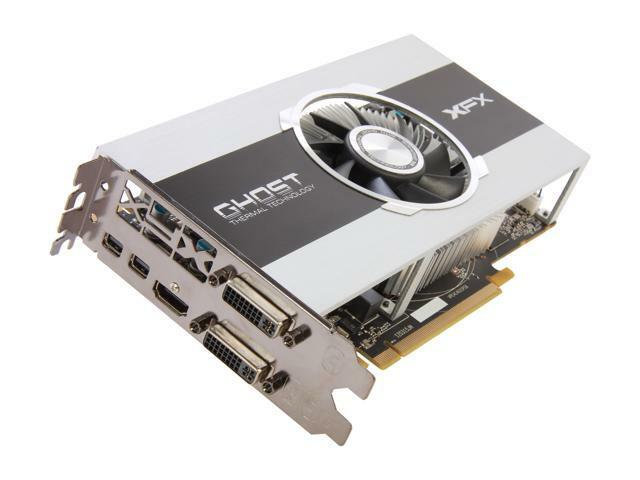 Based on the award-winning GCN Architecture, this XFX Radeon HD 7850 is engineered for supremacy with the industry’s very first 28nm GPU design. Packed with incredible features, such as support for PCI Express 3.0, the ultra-efficient AMD ZeroCore Power technology and gaming at resolutions up to 7680x3200 with AMD Eyefinity technology, serious gaming starts here. The XFactor - See the XFX Difference Built with the first class components including solid capacitors, ferrite core choke, dust-free IP-5X fan and XFX bracket design, this card delivers unmatched reliability, stability and durability even under the most demanding environments. GCN Architecture The Radeon HD 7850 boasts revolutionary new GCN Architecture which is optimized for gaming and compute. And the DirectX 11 support brings your visual experience to a new level. Eyefinity The next generation of AMD Eyefinity technology features all-new support for stereo 3D, universal bezel compensation and brand new display configurations, bringing you ultimate panoramic computing experience. AMD App Acceleration Powered by a set of innovative hardware and software technologies working in concert behind the scenes, AMD App Acceleration gives you enhanced speed and performance beyond traditional graphics and video processing. Pros: lasted over 5 years. Cons: it could not outrun the darkness of entropy..
Pros: The card in the years that I have owned it has managed to sustain itself against even the most demanding titles up until very recently when I tried running DOOM 2016 on it. It was then that I replaced it with a RX 470. But otherwise the card's performance is top notch and still holds up today. The cooling in the card is also exceptional especially with new thermal compound. The size of the card is also fantastic as it's a very small card for what it provides. Cons: None that I can think of aside from the 1 gigabyte of video memory. Cons: not a great performer for the price. I eventually upgraded for about $75 more and got more than 2X the performance. Are you having any issues with it? if you need any help, please let us know. Pros: Shockingly powerful for as old a card as it is. Cheap when I got it. It's held up well and cleans up easily. Gets freaking hot! Make sure your case is designed well. Other Thoughts: Bought this thing back in 2012 on sale. It's served me well but I'm finally upgrading to a 970 FTW+ so this little beast will be going into my son's gaming PC (he doesn't play anything more demanding than Skyrim with mid settings). This was my third card from XFX and after years and years all three are still working! Pros: Being used in a HTPC/Living room gaming PC. Thank you for this review. If you have any questions, please let us know. Pros: Besides being AMD, Nothing. Cons: Dead, will not boot. Other Thoughts: This is the second XFX brand card I've had that has catastrophically failed . This thing came with a door hanger that said "busy gaming" or something to that effect. HA! More like, busy troubleshooting my PC because it will not boot!. XFX should spend the money on better IC's and PCB's than fancy machined expansion slot cutouts and cardboard door knob hangers. I will not buy XFX gear again. Pros: Works great I mostly play GW2 WvWvW with medium setting. 1920 x 1200 GPU core only maxed to 90%. Cons: 1gb ram what holds it back 100% usage, some crashes due to low vram memory. Other Thoughts: I will have upgrade GPU with more vram to play on high soon. If I would have got the 2gb I would get 2nd to xfire. Cons: Similar issues as other owners. After playing a heavily modded Skyrim on ultra settings I have had no issues, but with Tom Clancy's Ghost Recon: Phantoms, it will crash after running for random amounts of time. The game is not as graphically intensive and there seems to be no overheating issue, but the screen goes black and I have to reboot. It sounds like your Tom Clancy's installation may have an issue. I would also advise a clean install of the game, as well as a driver reinstallation to be sure.